Here at Back to the Land, we're been selling great quality natural foods and groceries since 1971. One of our favourite super foods is flax seeds. They are high in fibre, which is great for the heart. They are also very rich in omega-3 fatty acids and antioxidants as well. We believe the best way to use flax seeds is to grind them into powder. When ground flax are mixed with water, they make a great fantastic Vegan alternative for egg. Our Vegan Flax muffins uses ground flax as a substitute for egg. are delicious, light and healthy. 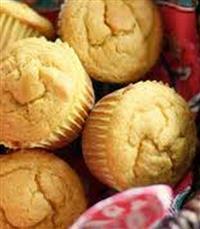 To make these muffins, you'd need: a third of a cup of unsalted pumpkin seeds - toasted, three tablespoons of Flax Seeds, half a cup water of, two cups of Spelt Flour, one and a half cup of barley flour, one tablespoon of baking powder, one teaspoon of salt, one and a quarter cup of apple juice and half a cup of canola oil. Firstly, you'd need to preheat oven to 375 degrees and grease your muffin cups. Then, in a strong blender or food processor, grind the Flax Seeds until they become a powder. Slowly add the water and process the mixture until you end up with something slightly gummy - about 30 seconds. This will be your egg substitute. The in a large bowl, combine the rest of the dry ingredients - the flours, seeds, baking powder and salt. Add oil to the flax seed mixture and process until they are well blended and frothy - about 2 minutes. Then, just like your average muffin, stir the wet mixture with the dry. Add more water if the mixture seem a little dry. Then spoon the batter into the muffin tins and bake about 15-20 minutes. Please use the Contact form on the right for Recipe: Vegan Muffins information and ordering. Your message will be sent to Back to the Land only. Privacy & Anti Spam protected.